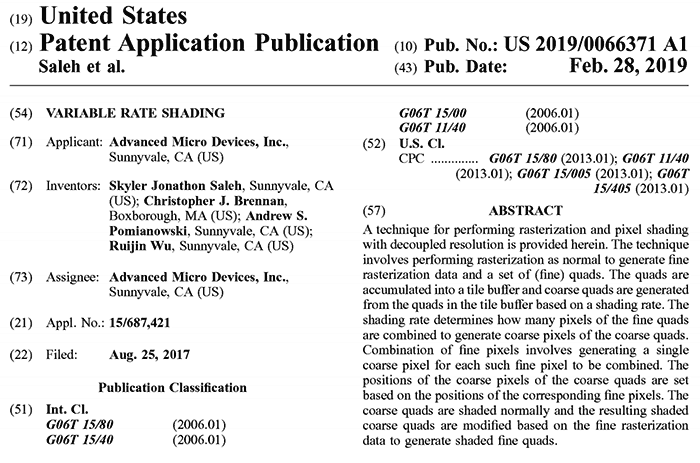 A patent filing by AMD has recently surfaced, indicating the chip designer's intent to use Variable Rate Shading (VRS) technology to speed up output from future GPUs. 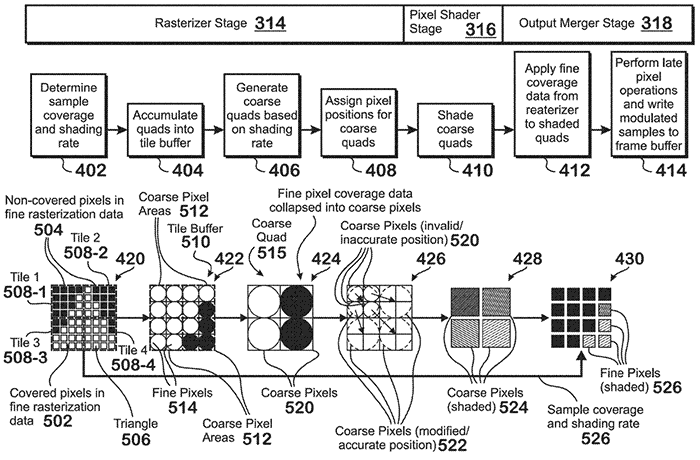 The patent was originally filed back in 2017 and explores VRS being used by next-gen GPUs. At that time, the furthest ahead the AMD GPU roadmap went is to the Navi GPU, offering "scalability and next-gen memory". Note that Nvidia has already implemented VRS to work with its Turing GPUs, and you can read more about that on page 6 of the HEXUS Editor's examination of the Turing architecture. A big clue to the attraction of VRS lies within its name. Its applicability is most relevant to VR headset rendering where the centre of the displays can offer the sharpest detail with lower fidelity required towards the edges and corners of the HMD displays. 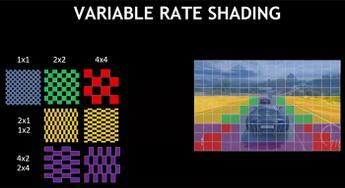 As the HEXUS article discussed, there are various other ways to apply VRS, such as Content- and Motion-Adaptive Shading so it can be more useful to use in gaming using a traditional monitor, for example. There aren't many games available on PCs with VRS implemented as yet. Nvidia's own figures suggest that VRS could deliver a 50 per cent increase in frames per second (fps) in games compared to the GTX 1060. However, a patch to Wolfenstein II: The New Colossus to implement VRS-alike Nvidia Adaptive Shading offered up just five per cent extra performance on an RTX 2080 in this mode. 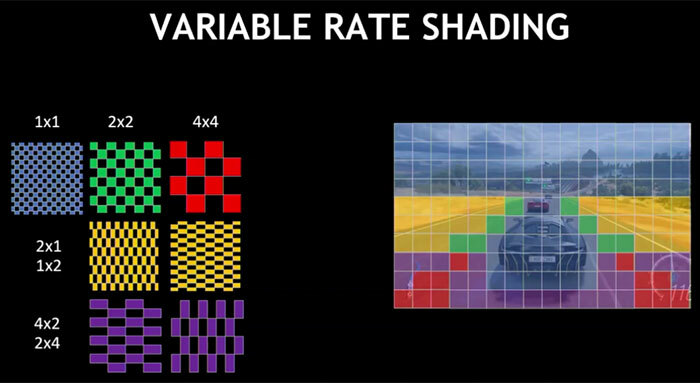 Nvidia presentation slides highlight VRS use-cases. It certainly isn't set in stone that VRS is coming to AMD Navi GPUs, and AMD hasn't publically indicated it will. However, it would be a logical move to 'keep up with the Joneses' and make more efficient use of AMD GPUs in PCs and consoles. Furthermore, VRS is particularly useful in VR display rendering in HMDs which are expected to continue to progress and grow in popularity for PC and console users. Source: Free Patents Online, via Tom's Hardware. 50% increase sounds good.But when will it be available? This is the classic “up to” scenario. It's anything up to 50% so that's anything from zero to 50%. The 50% being a theoretical maximum which will never, ever be reached outside of ideal testing conditions or equations on a blackboard. The proof of the pudding is in the real world application and that was ~5%. That's what you can expect to see from this. And that's why people aren't leaping on it immediately to make their games run faster which answers your question about availability. Right so you're so clever that you can go around calling people dumb without even justifying why. Don't you DARE go calling me a moron unless you can back that up with a justification and an explanation as to why what I've said is wrong. I'm more than happy to be corrected but to go around insulting people like some arrogant smart arse is just… well… arrogant. Now, tell me WHY I'm wrong or apologise.